Toronto real estate buyers and sellers may be on two different pages, according to a new survey. A survey conducted by Ipsos, on behalf of the Toronto Real Estate Board (TREB), shows an increasing number of homeowners are preparing to cash in. The larger group of home sellers, will also be met with a decreasing number of people that plan on buying. A lot more homeowners are expecting to sell their homes this year. 40% of survey respondents said they were likely to sell in 2018. That’s a 33.3% increase compared to survey respondents the year before. The significant increase in selling activity comes off of the record low inventory that started last year… before levels increased significantly. Those planning on selling are mostly upgrading, but a surprising amount weren’t. The vast majority, 75%, said they would buy a new home. However, 11% said they would rent their next home. Yes, slightly more than one in ten people are cashing in to rent, which is pretty interesting. The other 14% said they would engage in another living arrangement, such as moving in with family. Low rental inventory will throw a monkey wrench into those plans to sell and rent, but that’s what they’re planning. The number of people planning on buying a home is also on the decline. This portion of the survey focused on just prospective homebuyers. Only 26% of people had plans to buy a home over the next 12 months. This is a 7% decline, from the number of people that had plans to buy the year before. That would be the second decline in row, where that number has dropped. The increasing gap between buyers and sellers should ease the pressure on prices for buyers. Coming off of a record low year, almost everyone in the industry knew that inventory would rise. What most people didn’t expect is that buyers would start to taper off, while inventory is rising. This issue becomes even more complicated, as more new units are projected to the hit the market than are typically absorbed through new household formation. If prices rise this year, it would technically be against all logic. The most interesting takeaway is the pressure towards rentals. Historically, Toronto rent price have an inverse relationship with home prices, and this setup appears to reflect that. Always the way. Everyone always thinks they’re going to beat the market, and sell at the perfect time. Now those planning to sell will drive their home prices down, and drive rental prices up at the same time. You’re probably not going to make much money that way. There’s a reason smart money sold into the frenzy last year, and before the Ontario Fair Housing Plan sent rents soaring. It’s impossible to beat the market. If you own a house, chill, relax. The market will be fine in a few years. If you all panic sell, you’ll drive the value of your own house down. When the average DUMB Canadian doesn’t have $1000 then the rest of us just toss around some LULZ and then keep living it up YOLO style…what has permeated through the country the AVERAGE Canadian not having $1,000 due to over leveraging and little to no discretionary income. Michael is correct, “Keep Calm and Home On” as the market will rebound albeit not in a few years but approx 8-15 assuming wages increase and high employment for full time workers. However I don’t believe the added rate pressure and the extent of the initial drop will be enough from most to weather. Winter is coming. Based on what I’m seeing out there in the 416 areas lately, there is such a lack of quality properties available. An increase in housing supply would serve to bring the market toward balance. Healthy and needed right now. Current supply is as tight as last year in some areas. 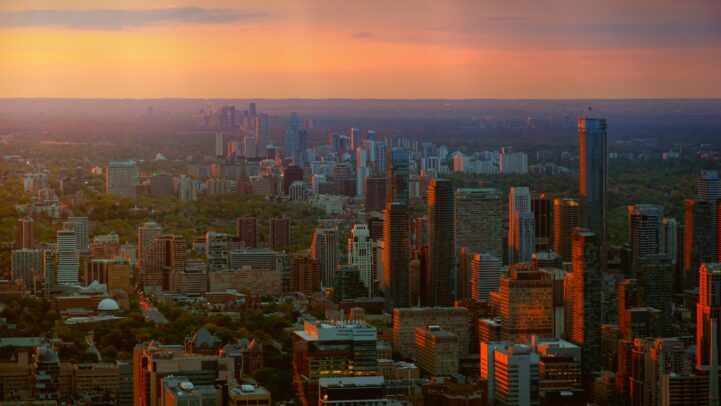 Multiple offers still occur regularly in Downtown Toronto, Bloor West, High Park, East York, Leslieville, Riverdale, Summerhill, Lawrence Park, The Junction and many other high demand neighbourhoods. My recent look at open houses with clients had an opposite experience. Plenty of people coming and going. It looks a lot like a year ago, activity wise. I’m hoping cooler heads prevail when it comes to offer prices by these buyers. The stripping of inter-generational wealth that will take place over the next 1-3 years is going to be catastrophic. This is a self reported survey coming off of a 5 year bull run and just, more or less, one quarter of declines (a limited trend especially in real estate). No media scares. Agents are still beaming. Only chatter that the market is broken. Ipso facto; when the bodies hit the floor and reality sets in, expect far worse. To Jim’s point; a massive self off within a relatively short period of time is going to crater some housing markets. Once FOMO takes over, which seems to be how everyone is conditioned now, you will see people with a lot of equity do whatever they can do get something. Market indicates $800K, list at $700K and get out, bought house for $80K in 1970 and put $100K over the years, very healthy profit. Better to sell for $700 and $650…this is similar to a run on a bank. Those never end well. I think baby boomers are the true wild card when it comes to the severity of this correction/crash. As a group they have all almost hit the retirement age, they own homes that have appreciated 3-5 times since they purchased . It will be interesting to see how many of them are relying on the equity in their homes to fund their retirements. Any of them who are planning to sell in the next 5 years may rush for the exit if/when they think their retirement fund is in jeopardy. While newer buyers may hold on if possible to avoid locking in a loss, the motivation of the boomers will be to preserve their wealth and lock in their profits. – for the 11% planning to rent, are they boomers who will likely never buy again? – for the 14% planning to slum it with relatives, are they young ‘uns who are waiting to buy? Either way, it doesn’t look good for the Audi dealerships! I sold last April and have been renting ever since. By 2021 I think the annual price loss will be less than the 20k I spend on rent, I will jump back in then. So am I. It sounds good. Gross Rent – Gains from re-investment of your equity – Interest Expense on your previous mortgage – Property taxes – Difference in utility and maintenance costs and tax benefits (if applicable) +/- Change in the price of your old property 1 year down the road. Of course, this is just a financial formula and doesn’t take into account the benefits of having more liquidity and mobility now than you did before, or the psychological aspects having to deal with less bills and monthly payments. Is it just me or the results of this survey seem inherently flawed?! One would think that It would be impossible that 100% of those who are planning to sell and buy something new, would be upgrading and 0% are planning to downgrade! Something’s definitely not right there… either a portion of that 75% are the “downgraders” or not all of those 25% are non-buyers. BTW Folks, its going to be very interesting to see how the RE industry will desperately attempt to put a positive spin on the data once we get to the end of February and average prices for detached homes in the GTA are down 24-27% YoY. The YoY data has been their saving grace until this point as MoM data has shown declines in all but one month since March/April. I do wonder if March is when the panic selling will start for these 25% and others looking to cash out, once the YoY data starts to look really bad. You’re talking like every person who buys real estate is a speculator – unless you’re retiring or living with your parents, you still have to live somewhere. When you have kids, it’s hard to go from owning a home to renting; there’s just less security or permanence with renting. Why would people start selling if the YoY is down? It’s not a stock or cryptocurrency, people live in houses / condos. The only people scrambling to sell will be speculators, and there really aren’t as many of those left in the market as you would think. Yeah, I was planning to sell and rent also. Until I saw what it cost to rent, and then I thought better of it. Ended up selling and “downgrading” (meaning, we bought a house for about 100k less than what we sold our house for) even though it was a bigger, detached house, just further from downtown compared to our East York semi-detached. There is no “one-size-fits-all” when it comes to real estate / renting – unless you live with your parents, you have to live somewhere. If you have the money for a downpayment and the monthly carrying cost is the same or less to own than to pay rent, it seems like a no brainer to own, as long as you can afford the monthly payments even with increased mortgage rates. If you don’t have the money for a downpayment, you don’t really have a choice but to rent. But ultimately, don’t buy or rent what you can’t afford and you’ll be alright. I completely understand your comment Jimbo. I am a Toronto Realtor and many of my clients rightsizing wanted to rent. They ended up buying an apartment or travelling or moving out of the city. I cant believe the price of rentals myself. As I often say to my clients though, the options are simple, your pay your own mortgage or you pay someone else’s.